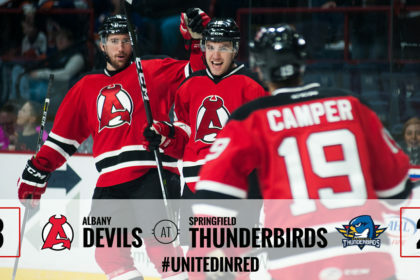 SPRINGFIELD, MA – In their first ever meeting with the Springfield Thunderbirds, the Albany Devils came out on top Wednesday, 3-2, in overtime. Ben Sexton netted the game winner with 1:40 left in the extra frame. 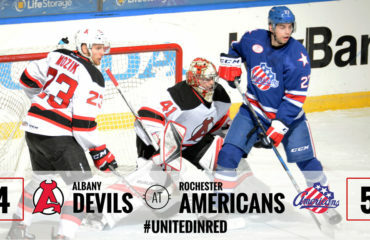 Albany improves to 21-15-0-1. The Thunderbirds move to 14-13-5-2. Springfield was able to get on the board at 6:42 of the first on a Brent Regner goal. Regner threw the puck at the net that found its way through traffic past Albany netminder, Ken Appleby. The assists went to Tim Bozon and Kyle Rau. Albany responded at 11:47 on a Carter Camper backhand. Ben Thomson was able to grind out a turnover behind the net and feed the puck to Camper who slipped it over Thunderbird goalie, Mike McKenna’s shoulder. 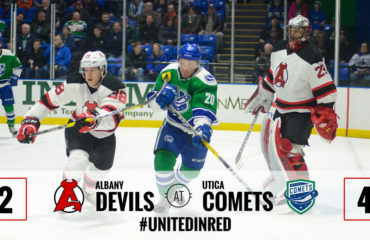 The score remained deadlocked until 6:34 of the third period when Ryan Kujawinski found the back of the net on a two-on-one with Rod Pelley to give the Devils the lead. Brian Ward picked up the second assist, earning his first ever AHL career point. Springfield pulled McKenna for the extra man and was able to get the game tying goal at 18:19 of the third on a Mackenzie Weegar tally to force overtime. In a back and forth overtime, it was Sexton who scored the deciding goal when he found the back of the net at 3:20 of overtime. The goal was Sexton’s tenth of the year and was assisted by Blake Pietila. 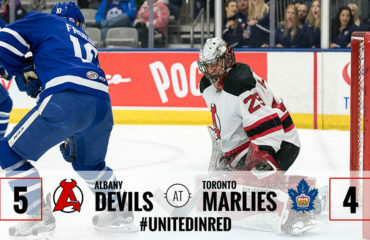 Appleby faced 35 shots, stopping 33 in the win. He improves to 9-5-0-0. McKenna stopped 34 of 37 shots and moves to 6-7-5-0. 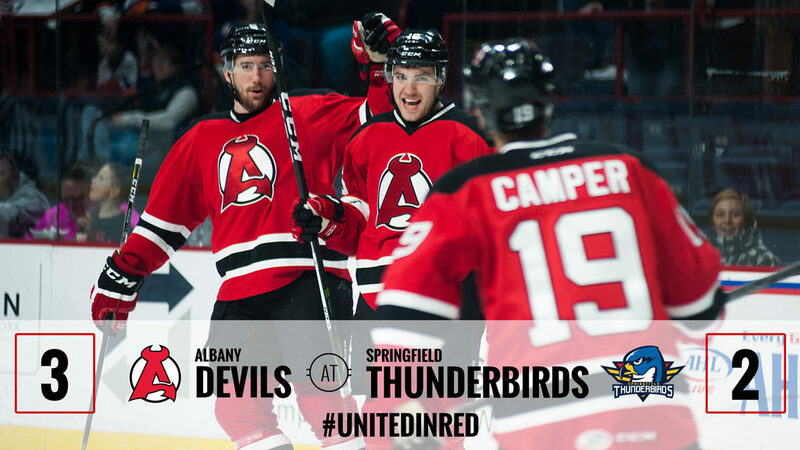 The Devils return home for a rematch against the Springfield Thunderbirds Friday at 7:00 pm at Times Union Center.